If I wasn’t doing this I would: give owning a bike shop a go! Most impressive person I’ve ever met is: my wife. I unwind by: being a road cyclist. I drive everywhere, so I can bring my bike and explore. On my desk right now is: an Oglebay VMS bell and mug full of cold, bad coffee. 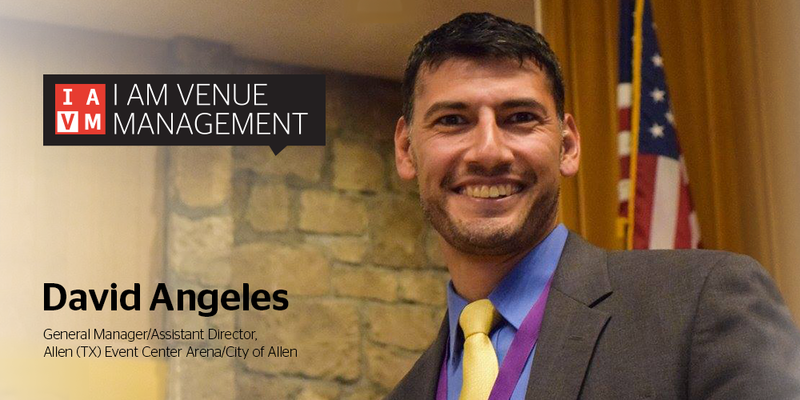 My favorite IAVM program I ever attended was: Venue Management School. If I were on the other side of the seats, I would: bring back the circus. I’d ride my bike across a tight rope! One trait an up-and-coming venue manager should have is: to be a leader and take ownership. Be willing to learn and grow, because you will never know it all. One up-and-coming venue star in the industry is: Ross Girouard, the director of operations and production at Allen Event Center. In addition to his stellar on-the-job performance, he was one of the first CVP’s, is involved with IAVM committees, is a VMS grad and has VMS-GI on the horizon. One of my goals for this year is to: develop a number of “mini” special events to take place on the exterior of the venue before hockey games to help drive additional economic activity to the area and assist the hockey team with the overall fan experience. The ultimate goal is to be successful in the execution and garner positive results. How do you plan to help elevate the profession? I serve on the IAVM Membership Committee as vice chair. The committee is a passionate group, and we have worked hard to grow membership and continually improve member benefits. I hope to continue to be part of the exceptional group for years to come. I’m a believer in the value of IAVM schools and programs. I promote and encourage staff and other professionals to participate. Allen event staff presence at VMS has become a norm, and I don’t see that changing. Where do you see new growth opportunities in the profession? In security. We are already seeing better alignment and communication among venues, professional associations, first responders, and state and federal engagement. It’s unfortunate on how we got to this point, but the discussion and collaboration has made for safer venues. Others include the trickle-down technology to improve fan engagement, and how A/V and enhanced in-game production options are becoming increasing affordable. How do you stay current with industry trends and developments? Read, and you can’t do it enough. Athletic Business, Sports Business Journal, Facility Manager, The Meeting Planner Magazine, etc. I take advantage of webinars and industry trainings. Paying attention to federal, state, and local legislation is important as well. Who are three people you’d invite to a dinner party and why? I’m a family guy, and while there are great people in the world, none are better than my family. I have six siblings and a large extended family, so my dinner party of three would be crashed. Gina Brydson is IAVM's director of membership. You can reach her at gina.brydson@iavm.org.